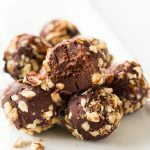 Pecan truffles are the perfect no-bake dessert for the Kentucky Derby, Thanksgiving or Christmas! These bite-sized treats taste like chocolate pecan pie. 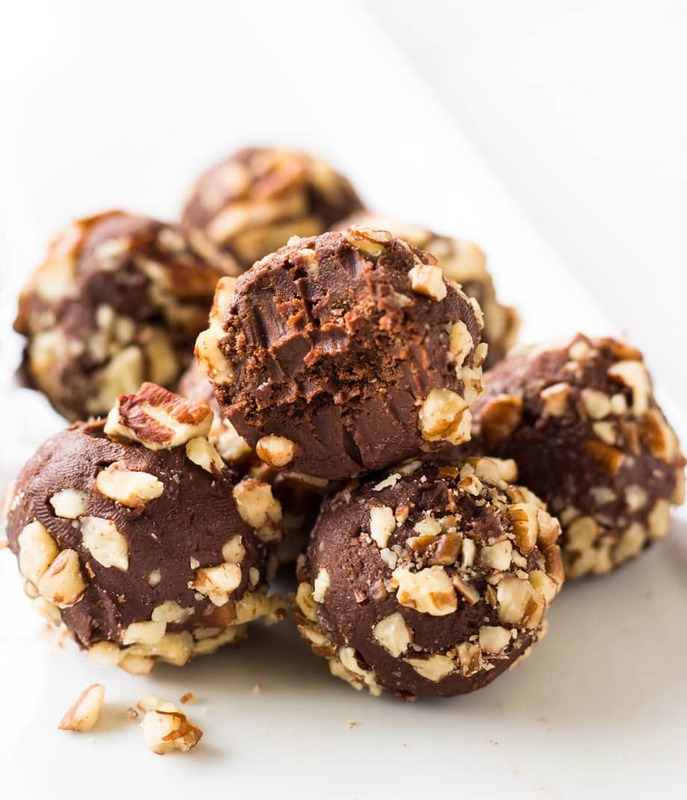 The Kentucky Derby is soon and to get people in the spirit I’ve made chocolate pecan truffles. Made with Kentucky bourbon, shortbread cookies, chocolate and pecans, these little bites taste just like derby pie! If you’re unfamiliar with derby pie, it is basically a pecan pie with chocolate and Kentucky bourbon. It is incredibly decadent, which makes these truffles the perfect serving size! 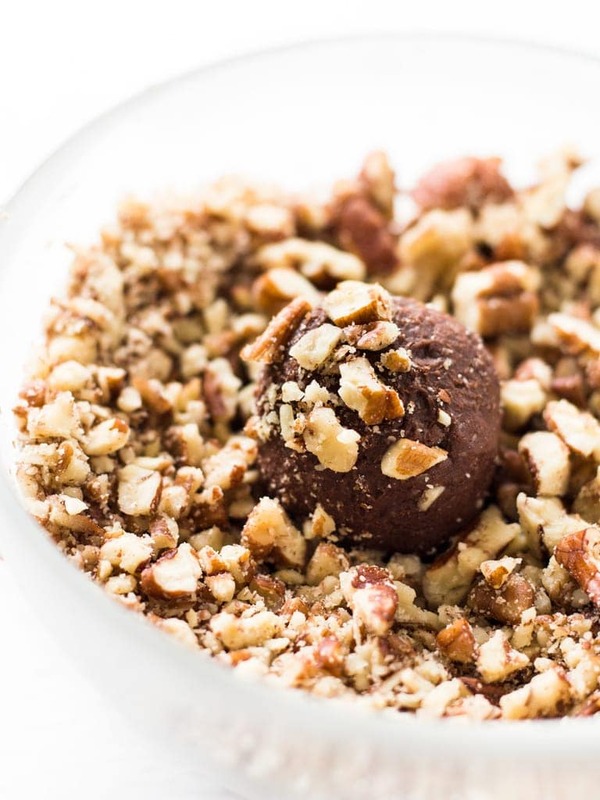 All you need to make these truffles is a microwave and a food processor (and honestly, you could even do this without a food processor). I started by melting the chocolate so it had a few minutes to cool. Then I crushed the shortbread cookies in the food processor. From there, you add all the ingredients to the food processor and then chill the mixture until firm. Roll the mixture into 1-inch balls and cover them in crushed pecans for garnish. Simple as that! And just like derby pie, these chocolate pecan truffles are rich and deliver a kick. I highly recommend using good quality chocolate for this recipe as it is a key ingredient. It will make the truffles even more decadent. And don’t worry, no matter what chocolate you use the bourbon will definitely be noticeable. It gives each truffle an extra kick without preventing you from driving home from the derby party (unless of course you’re chasing derby truffles with mint juleps). 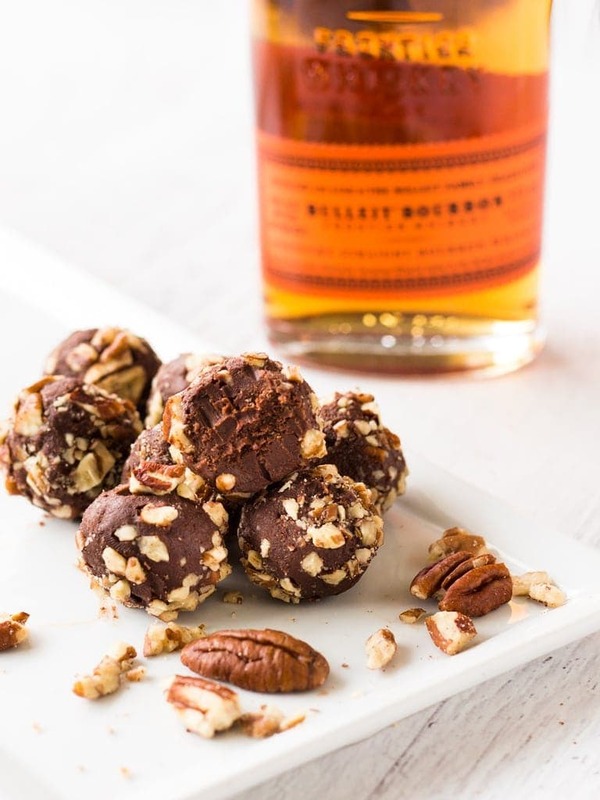 Chocolate pecan truffles aren’t just for the Kentucky Derby, mind you. Pecan pie is a fan favorite at Thanksgiving and Christmas as is pretty much anything chocolate. 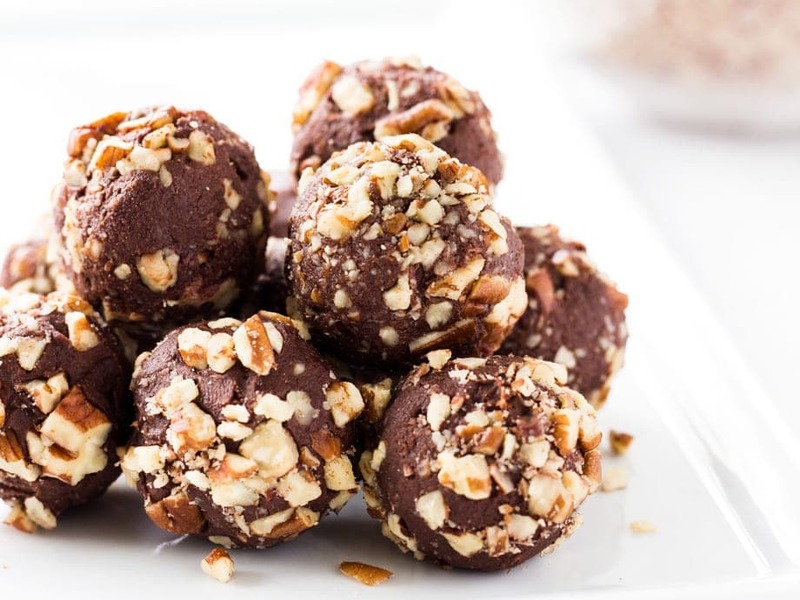 With that said, I say these truffles make a good no-bake holiday dessert! Place chocolate and butter in a microwave-safe bowl. Melt chocolate in microwave for 3 minutes on 50% power level, stopping to stir everything 30 seconds. Set aside to cool slightly. In a food processor, pulse shortbread cookies until they turn into fine crumbs. Add melted chocolate and pulse until combined. Add heavy cream, bourbon and vanilla, and pulse until combined. Shape mixture into 1-inch balls (about 2 teaspoons per ball). Roll in chopped pecans. Place on wax paper-lined baking sheets. Chill 1 hour. Store in an airtight container in refrigerator up to 5 days. I didn’t realize that truffles weren’t so hard to make. These look delish! Do you think they could be made without the bourbon? Any substitute? 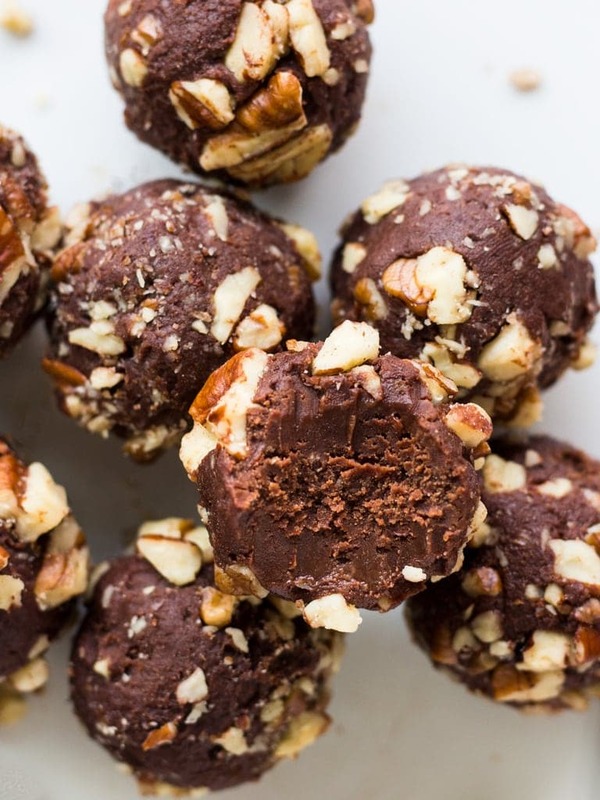 These chocolate pecan truffles look amazing! No doubt they are delicious. Thanks for sharing at Snickerdoodle. Pinning. I love a good truffles recipe and your recipe hits the spot! These look really divine, Haley. Thanks for sharing at Fiesta Friday party!